Last Friday, we showed a new version of the Gmail app in the video , which comes from a leaked Android 4.2 ROM and bring some long-awaited new features - including pinch-to-zoom in the message and wiping gestures. 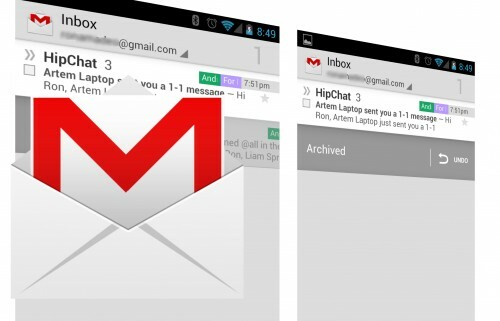 Now the new version of Gmail for rooted android version 4.0 is available on the net. We offer the new Gmail app to download and show how to install them. Note first: install Unfortunately, Google has changed in this release, signing, and therefore one can not simply download the app and. Instead, a little more work is required, so this guide. But the fuss worth it at all? In any case - the new Gmail app is great and until the release of Android 4.2 for a few weeks move to the country. A device with at least Android 4.x, ie Ice Cream Sandwich or jelly bean . For tutorial install android 4.2 gmail apps read and do exactly with the folloong instruction. Who installed Titanium Backup, ROM Toolbox Pro or a similar tool can very likely save the whole effort. Simply delete the old Gmail app on this version, reboot and install the new one. If that does not work or such a tool does not exist, here the detailed explanation. First, you should make a backup. (Can not hurt anyway) so either a complete nandroid backup via CWM or a backup of the Gmail app with Titanium Backup. It is important now that the old GMail app to remove it completely. For this purpose, start the file manager of choice. Now navigate sequentially in the directories /system/app and /data/app and delete all instances where the Gmail APK - which may or may not be included in both directories. This is kept in the directories looking for files with the " gmail start "or the package name com.google.android.gm-... include. A good reference point is of course the file icon. In File Manager, delete these files. For this you may need in the file manager to mount the system directory writable. In Root Explorer is groping for something like " Mount RW ". Some custom ROMs you have besides the APK files ODEX also delete files that are located in the same directories. If not already done, install APKs from untrusted sources allow (Preferences -> Security -> Unknown sources). Now the APK file from Gmail 4.2 (download link below) and install by tapping on the download notification. When you first start the app you have to have unique setting up synchronization in the Google account. To the notification with the exclamation mark and call security access. Done! Have fun with the new version of Gmail .